More than half-a-million dollars are up for grabs Wednesday night. 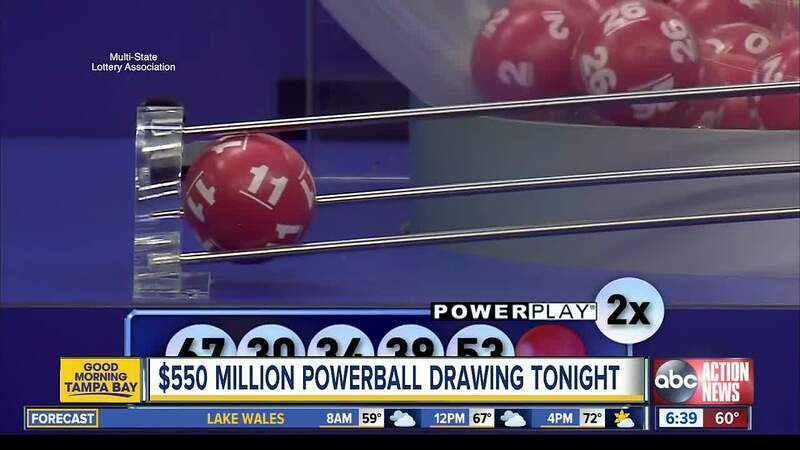 The Powerball jackpot has hit an estimated $550 million dollars with a cash value of $335 million dollars. After no one matched all six numbers in Saturday's $495 million drawing, the jackpot is growing to an estimated $550 million for Wednesday's drawing. Two tickets worth $100,000 each were sold in Florida for Saturday night's (March 16, 2019) drawing. Two other tickets worth $50,000 each were also sold in Florida. But, there's still hope. You have a better chance of winning tonight's Powerball jackpot than you do filling out a perfect NCAA bracket. The odds of that are one in 9,223,372,036,854,775,808. The odds of winning tonight's Powerball jackpot are one in 292.2 million. So, we're saying, there's a chance! The deadline to buy tickets for Wednesday night's drawing is 10:00 p.m. EST. The odds of winning are one in 292.2 million. Click here to learn more about Wednesday night's drawing.